Lake McArthur is located in Yoho National Park in B.C. in the Rocky Mountains. The trail to the lake starts at Lake O’Hara and is one of the most scenic trails I have ever been on. From your first sight of the shimmering waters with its range of blue tones, you want to stop and stare and wonder if there is anything comparable. 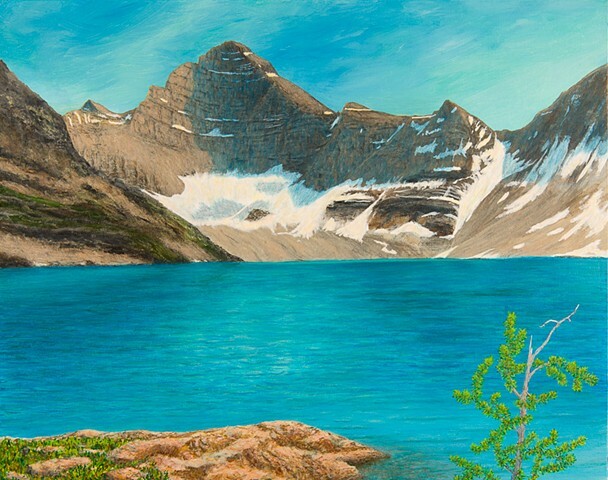 In my painting, I wanted to capture these shimmering blue tones of the lake and the high elevation with a scraggly, stunted larch tree. Mount Biddle is a fitting background for this scene.